Reward schemes encourage selfishness because they give people something for nothing, right? Well, not this one. BetterPoints users are rewarded for making positive, often difficult, changes to their behaviour, and many donate those points to charities and community groups. Take Matthew Clarke, aka Maff, who earned £166 – that’s a lot of points – for a local community group by cycling to work. Maff could have spent that money on himself, but instead he donated it to Our Place Community Hub, which provides mentoring and advice services for children and families in Sutton Coldfield. They have a drop-in cafe that gives free legal, financial and mental health advice, and Maff racked up enough points to pay for five hours of it. His donation also covered the cost of two one-to-one mentoring sessions with children. How are the points paid for? We pay for many of them ourselves, out of our own pocket, because we are committed to giving our users the incentives they want, and our users want to help others. And because we believe strongly in all of us pulling our weight for a better society; that is, in fact, why we started BetterPoints in the first place. 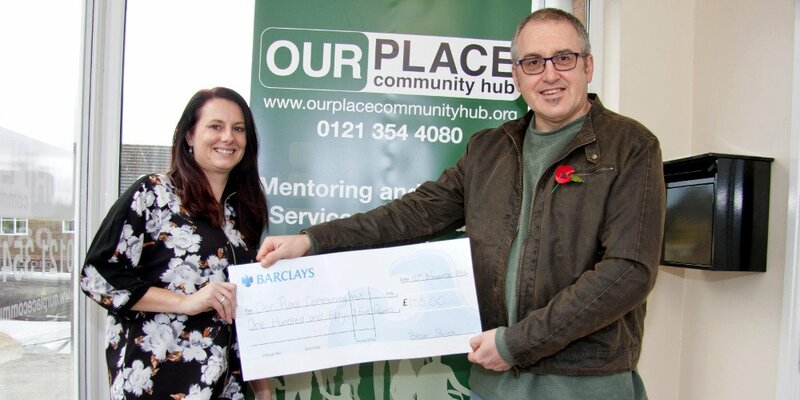 Photo by Najm Clayton, Sutton Coldfield Local News: Matthew Clarke presents his cheque to Kelly Round, Director of Our Place Community Hub.